The 2017 Maserati GranTurismo graces the roads with classic Italian elegance backed by Italian power. In either coupe or convertible, it's a statement of success and taste, more expensive than the BMW 6 Series, not as extravagant as a Bentley Continental or Aston Martin Vanquish. This year, Maserati celebrates 60 years of grand touring coupes with a limited-edition GranTurismo model. The 2017 Maserati GranTurismo is perfect for anybody looking for a 4-passenger luxury-sports coupe or convertible offering the Italian style and personality that you just can't get in a BMW, Mercedes-Benz, Porsche or Aston Martin. The rarity and heavenly powertrain are practically icing on the cake. Maserati dealerships are rare, meaning getting your Italian coupe serviced could be a hassle, especially considering its less-than-certain reliability history. There's also a distinct lack of modern safety options and technology. More modern competitors like the Porsche 911 and BMW 6 Series offer more in all three areas. Maserati celebrates 60 years of grand touring cars with a limited edition of the 2017 GranTurismo. Limited to 400 units -- including a numbered plaque -- the special edition gets interior and exterior styling enhancements and is available as a coupe and convertible. The 2017 GranTurismo's front and rear bucket seats are separated by a center console, and the front seats power forward to ease access to the surprisingly usable rear seats. The triple-insulated power-convertible top on the drop-top GranTurismo deploys in just 24 seconds, at speeds up to 20 mph, and rear rollover bars pop up to protect occupants in case of a crash. Special Edition models get unique seats with red contrast stitching and red tridents embroidered on the headrests, carbon-fiber trim, and that special-edition plaque. The trunk is big enough for two golf bags, or a couple of overnight bags. Even though the Maserati GranTurismo has been around for nearly a decade, the design isn't dated thanks to the classic Pininfarina lines. Its long hood and short rear deck with its integrated spoiler give it a classically sporty look, and the projecting grille and trident logo are equally classic Maserati. Special-edition models incorporate Extracampionario Grigio Lava paint on coupes and Extracampionario Rosso Italiano red paint on convertibles. Other special touches include a carbon-fiber hood painted the same color as the rest of the car, exterior carbon accents like the front splitter, door handles and mirrors, and specially painted brake calipers. The 2017 Maserati GranTurismo is a delight for all the senses. The thrilling acceleration provided by the Ferrari-built 454-horsepower V8 engine offers an accompaniment of an exhaust howl that sends chills up your spine and a smile on your face. It's like Pavlovian conditioning for car enthusiasts. A 6-speed automatic transmission is the only one offered, but its seamless operation proves no impediment to the thrills of this grand touring machine. In Normal drive mode, the Skyhook suspension quells road imperfections in a way that makes it the ideal Italian sports car for loafing along the coast. Switch to Sport mode to change the GranTurismo's attitude to a more aggressive posture. We love the feel of the direct, hydraulic-assist steering, and the race-bred Brembo brakes (6-piston in front) erase speed with confidence. As sharp and responsive as it is, the GranTurismo always maintains a sense of grace, polish and refinement. It should come as no surprise that these are expensive cars. When you wrap in the destination charge and the gas-guzzler tax, the Manufacturer's Suggested Retail Price (MSRP) for a 2017 Maserati GranTurismo coupe is more than $135,000, while convertibles start at nearly $150,000. Of course options push the price higher, and opting for the Centennial edition with all the trimmings will set you back more than $180,000 for the coupe or nearly $200,000 for the convertible. That's a lot, but competitive with the likes of the Audi R8, BMW 650 and Mercedes-Benz S550 Coupe. Resale value should be good, but note that there are fewer dealers even than other premium brands. Be sure to check the KBB.com Fair Purchase Price before committing to a deal on a 2017 Maserati GranTurismo. The "base" 2017 GranTurismo is the Sport, while the base convertible model is simply known as the GranTurismo Convertible. All of them, regardless of model, come with a Ferrari-crafted engine, 20-inch wheels and Brembo performance brakes. There is also an interior awash in leather, a power-operated soft top on convertibles, and amenities like a navigation system, Bose surround-sound system, integrated HomeLink garage-door opener, and Bluetooth wireless connectivity. Convertible models also include an automatic rollbar-deployment system. One area where the GranTurismo shows its age is in modern amenities such as blind-spot monitoring, lane-departure warning, Apple CarPlay, Android Auto or radar-based cruise control, none of which are available on the Maserati. You can't even get a rearview camera even though a color navigation system is standard equipment, although front and rear parking sensors are offered. The multiple models increase the luxury and/or sport levels, and being an Italian luxury car, you can also get unique paint colors, various wood or carbon-fiber accents, and interior/exterior treatments. GranTurismo MC models are more performance-oriented with lower and stiffer suspension and aerodynamic enhancements. From the looks of it the 2017 Maserati GranTurismo should be sporty enough, but with a press of the Sport button you open up the exhaust, quicken the shifts and sharpen the Skyhook adjustable suspension for a firmer ride and sharper handling. Lots of cars come with shift paddles these days, but few have the Italian flair and design as the ones behind the steering wheel of the GranTurismo. And here, art meets science as the paddles shift gears with a simple click. There's only one engine available for the 2017 Maserati GranTurismo: a Ferrari-built 4.7-liter V8 work of art. With 454 horsepower (444 in base convertible models) routed to the rear wheels through a 6-speed automatic transmission, it's especially intoxicating when the exhaust system's bypass-valve opens above 3,000 rpm. The gas-guzzler tax is proof that fuel economy took a back seat to smooth, responsive and strong power delivery. The GranTurismo's 6-speed automatic transmission also offers a Sport mode for quicker shifts, a Manual setting for full manual gear selection via steering-column-mounted paddle shifters, and even an Ice mode for low-grip situations, forcing the transmission to start in second gear. With its Italian good looks and V8 engine, the 2017 Maserati GranTurismo makes a statement about success and taste you can't get in a Porsche 911, BMW 6 Series, or even the more expensive Bentley Continental and Aston Martin Vanquish. It starts with dramatically sweeping lines that could only come from Italy. Under the long hood is a V8 engine built by none other than Ferrari, and with 454 horsepower, it delivers on the promise made by the design. Inside, the cabin is refined and elegant, and even boasts usable rear seats. While it's true other cars are quicker to accelerate or have a faster top speed, few sound as good as the Maserati GranTurismo. 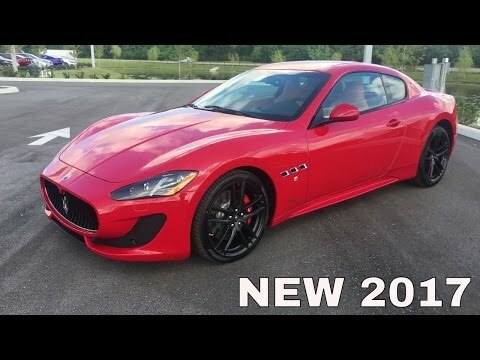 Here&#39;s Why The Brand New Maserati GranTurismo MC Is NOT A Good Car To Buy Right Now!! People should know that a new tire will cost a lot of money. Regular maintenance is several hundred dollars. it have had a lot of issues. It requires monthly trips to the dealer. It gets dirty too fast.